Weber Spirit BBQs - Versatility Is Their Speciality with Quality and performance. The dream of standing beside a gas bbq with an impressive cooking area, multiple burners, and a wide range of accessory options is not out of reach. Many people who cook on a charcoal barbecue feel reluctant to make the transition to gas. The jump from a charcoal grill to one of the larger gas bbqs can seem daunting, but it doesn’t have to be that way. The Weber Spirit series is a great place to kick-start your gas grilling adventure. After using a Spirit gas bbq for the first time, all of your reservations will melt away. It offers an abundance of cooking space, the option of direct or indirect heat. Upgrade your bbq with a host of extra features, depending on your needs. Grilling a delicious meal for family and friends has never been so quick and easy! The Weber Spirit series is the obvious choice if you want to get started with gas barbecuing. Created to make it simple for gas beginners to get on with the gas adventure, its features are extremely user-friendly, With the basic features you can do both direct and indirect grilling and begin to get the feeling of how to grill the gas way. The Spirit series offers three lines of models - the Spirit Classic, Original and Premium with either two or three burner tubes and a variable number of features. All Weber Spirit-models can be further upgraded with accessories-such as a rotisserie, griddles and Weber's Gourmet BBQ System. Built from its original foundations the Spirit range of gas barbecues has been radically re-styled and updated to emerge as a dynamic and really versatile, entry level, gas barbecue. With new features such as a handy condiment holder and a stylish storage space for gas bottles, the NEW Spirit range offers great value for money and guarantees years of effortless barbecuing and most importantly; terrific food. Get Spiritual - The Weber Spirit range has been developed to cover all bases of gas barbecuing. 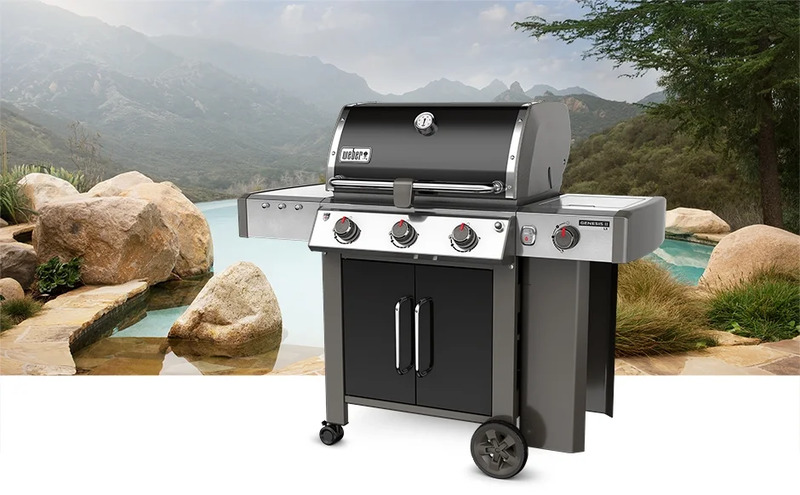 There are 10 models in the range; from the entry level Spirit Classic (available in two sizes) to the top of the range Spirit Premium S330, packed with features it makes a great all-round family barbecue! Efficient and easy to use, the Weber Spirit barbecues have a host of family-friendly features to make outdoor cooking a pleasure. Ranging from Spirit BBQ models with 2 or 3 burners and side burners. Designed for ease of use and efficient barbecuing, the Weber Spirit BBQ range is the perfect starting point for anyone getting into gas. between the Weber Spirit models? Take a look at our Weber Spirit BBQ guide. Weber Spirit Premium S320 BBQ - 3 Burners, Side Burner Colour Stainless Steel. Weber Spirit Premium E330 BBQ - 3 Burners, Side Burner, Sear Station, Colour Black. Weber Spirit Premium S330 BBQ - 3 Burners, Side Burner, Sear Station, Colour Stainless Steel. Your new Weber is for life. And life with Weber doesn’t stop once you’ve paid for it! At Weber they are always on hand to offer advice and help you become part of the exciting world of Weber. The best selling Weber gas barbecues - Weber Genesis BBQ range has just got better with their new features. Designed for life the Weber Genesis II barbecue models all come with a 10 year guarantee. For the past 30 years, the Genesis gas barbecue has become a name synonymous with quality, longevity, performance, innovation, and trust. Now, Weber has taken those 30 years of experience and have developed something even better for 2017. Welcome, to Genesis II. The Weber Genesis II line includes 8 unique models across two style platforms. 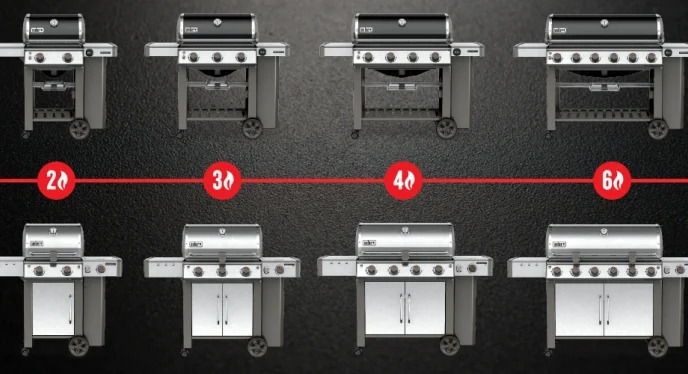 Each platform now comes in 4 different sizes ranging from a 2-burner to a 6-burner barbecues, matching the perfect grill to every life stage and every life style. Before then the issue with gas barbecues was that people often experienced flare-ups and that the food did not taste like on the charcoal barbecue. But when Weber's engineer, Erich Schlosser came up with the idea of the Flavorizer Bars that issue was fixed: When the grease and juice felt down on the bended metal bars placed over the burners a small amount of smoke was created-enough to make food on the gas barbecue taste like classic barbecued food. Furthermore the bars prevented flare-ups and the burner system made it possible to grill both at direct and indirect heat. Combined with a new innovative design and features an icon was born. Through the years the Genesis has been updated and new models have joined. Today you can get models with and without side burner and you can upgrade it with a rotisserie, GBS accessories, smoker box and much more. Making it possible to do all sorts of food on the barbecue. Each Genesis® II and Genesis® II LX barbecue is equipped with the same basic components and features; such as the GS4 high performance grilling system, iGrill 3 ready, and Infinity Ignition. 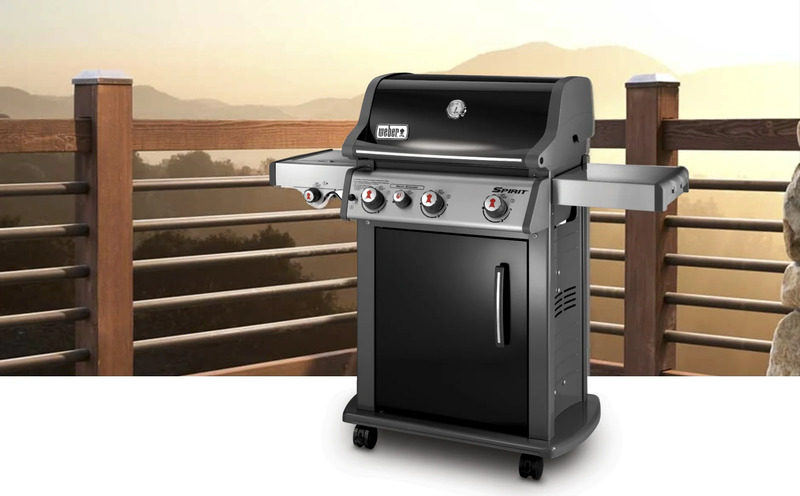 The Genesis® II/LX is powered by the exclusive GS4 High Performance Grilling System. GS4 is the core of all models. The engine behind the series. The power that creates superior results and makes life that much easier. So here’s to you, here’s to us, here’s to togetherness and amazing food! The GS4 High Performance Grilling System sets a new standard in the world of barbecue cuisine, and lands the Genesis® II and Genesis® II LX series of gas barbecues in a class of their own. This innovative grilling system is based on over 30 years of barbecuing experience, culinary expertise, and most importantly, avidly considering the wants and needs of the people who matter most – the barbecuing community. 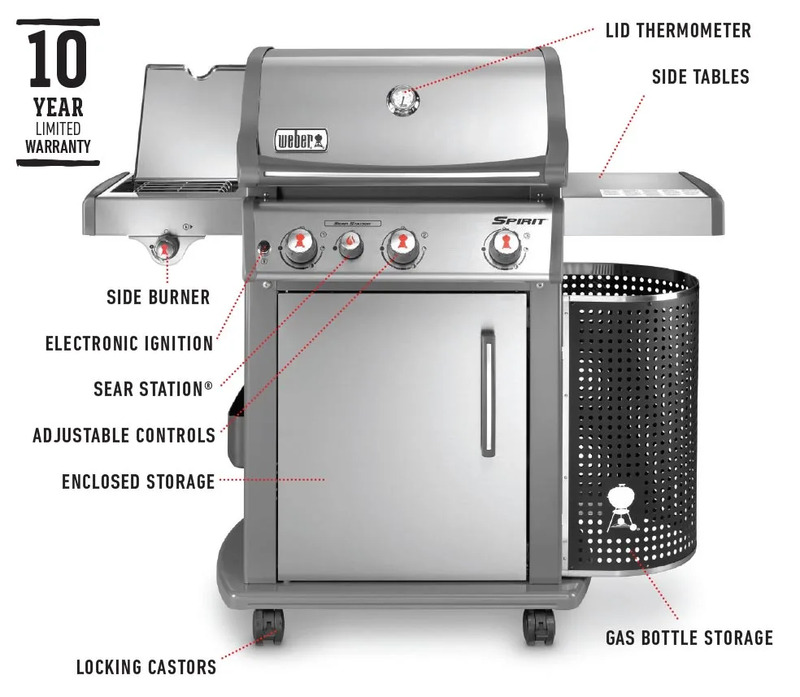 The GS4 grilling system is composed of four key components: The Infinity Ignition, High Performance Burners, Flavorizer® Bars, and Grease Management System. These components ensure that every aspect of your barbecuing experience is easy and reliable; from the moment the burners are lit to the general maintenance of your grill. And together, create the strongest barbecue engine within every Genesis® II and Genesis® II LX grill. The Weber iGrill 3 digital Bluetooth thermometer monitors the internal temperature of food from beginning to end, and will notify you once it has reached the perfect degree to serve. Simply download the Weber® free iGrill app on your mobile device and sync it to your Genesis® II or Genesis® II LX (iGrill device sold separately). How does the iGrill 3 work? - Each Genesis® II and Genesis® II LX barbecue is iGrill 3 Ready. This means that you can install the iGrill 3 digital Bluetooth thermometer into the side table and sync it to your mobile device. Connect up to four iGrill temperature probes and monitor your steak, chicken, or roasts all at one time. The grill cabinet provides extra storage space for all of your essential grilling tools. Everything you need at your fingertips, when you need it. Weber’s® innovative Infinity™ Ignition starts each burner quickly and reliably. You’ll be up-and-grilling on the first try, guaranteed. Your food will grill evenly and consistently on the entire cooking surface. The unique, tapered design delivers a steady gas flow from front to back. Less cleaning, more relaxing. 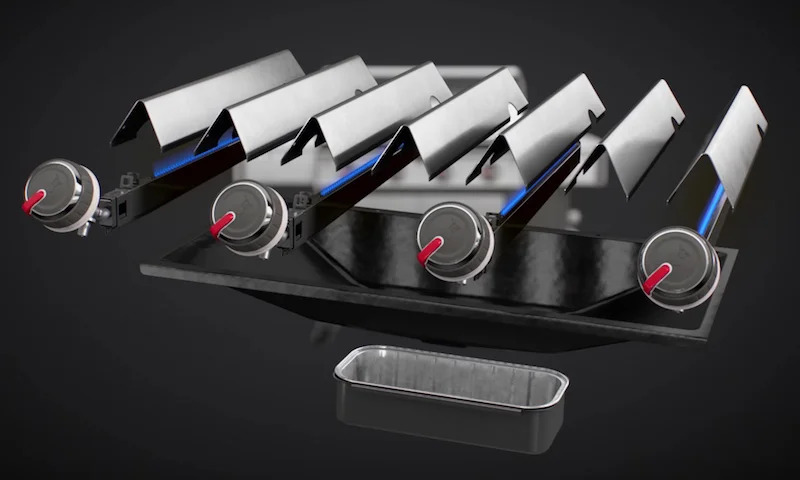 The grease management system funnels excess grease into the centered drip tray for easy cleaning, while Flavorizer® Bars evaporate drippings, adding smoky flavours to foods and help control flare-ups. The Genesis ll and Genesis ll LX series of gas barbecues accommodate every walk of life. Ranging in size from two to six burners, all equipped with exceptional features and the new GS4 high performance grilling system, power and convenience will never be dependent on the amount of space you have or people to feed. It's the most powerful grill engine from Weber to date! The GS4 grilling system sets a new standard in the world of backyard cuisine, and lands the two series of gas barbecues in a class of their own. Use the side tables to keep platters, seasonings, and tools within arm’s reach. Hang your essential barbecue tools on the hooks for easy access and organisation of your workspace. The left side table folds down in models equipped with two and three burners. The gas bottle is now located on the side of the barbecue, which makes it easier to replace. at the same time, it leaves a generous storage space under the barbecue for all your favourite barbecue accessories. The Genesis II LX series has an enclosed cart design providing additional room and storage of your barbecue tools. The many GBS inserts fit both series and open a universe of cooking possibilities. The Genesis® bbq range comes equipped with the Weber® Gourmet BBQ System grate. The Weber® Gourmet BBQ System has a 30cm removable central section. For use with the Weber® Gourmet BBQ System accessories. Such as the Pizza stone, Poultry Roaster, Griddle, Sear Grate, Dutch, Wok and even a Waffle/Sandwich Insert! Thanks to an integrated frame in the side table, the Genesis II comes fully prepared for the newly developed iGrill 3 thermometer available here. 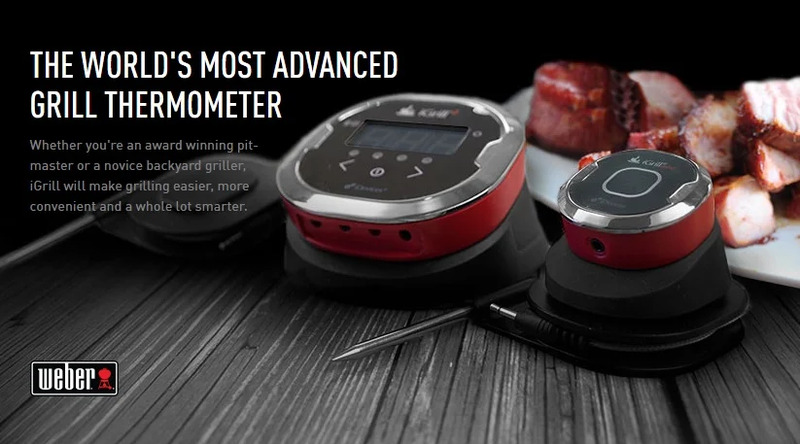 This is the newest barbecuing essential - the iGrill 3 digital Bluetooth thermometer monitors your food from beginning to end, displaying the real-time temperature on your mobile device. Once you’ve downloaded the free Weber® iGrill app, connect the iGrill to Bluetooth, and run up to four thermometer probes from your barbecue to the food. (extra iGrill probes sold separately.) Opening the door for a whole range of possibilities in combination with your smart phone. (iGrill sold separately). Concerned about buying online? Dont be... take a look at our 5 Star reviews from REAL customers. As a family business passionate about Weber barbecues you can be assured your in the best possible hands throughout your purchase and aftersales support. Don't forget a Weber BBQ Cover to protect your new Genesis bbq, Weber Toolset for flipping those steaks and any Weber BBQ Accessories. Please see Accessories tab of this page for related products. between the new Weber Genesis II models? Take a look at our Weber Genesis II BBQ guide.